During the course of my research for my new choreographic adventure Pachamama: Mother World, I went to see the Thunderbird American Indian Dancers, in their 38th Annual Dance Concert at The Theater for the New City, on Sunday, February 3rd. I was impressed by the amount (16) and diversity of dancers. They also told stories and played traditional music from the Iroquois and Native Peoples of the Northwest Coast, the Southwest, the Plains, and the Arctic regions. 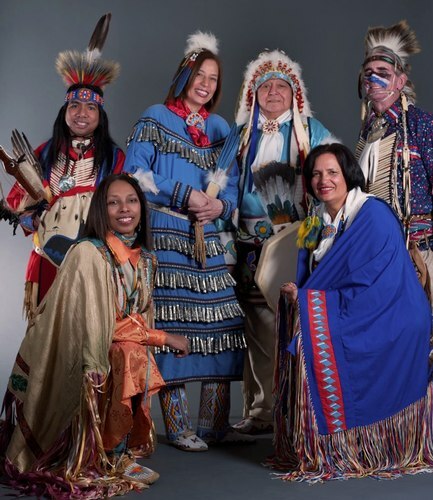 The troupe's appearances raise money to benefit college funds for needy Native American students and was inspired by the troupe's school residencies. Louis Mofsie, the Thunderbirds' artistic director, comments: "Educators try to supplement the kids' knowledge of Native Americans and to teach them about different cultures. But the emphasis is on how we used to live, in the past tense. The kids are never taught how to relate to us in the present." After the performance I signed up to their email list in order to be informed about upcoming events. On Saturday, March 16th, from 7-10pm, I attended a free Dance Workshop by the same company at The American Indian Community House in Manhattan. 1) The Stomp Dance is a ceremony that contains both religious and social meaning. The name refers to the "shuffle and stomp" movements of the dance. The Stomp Dance songs are in a call-and-response format. A leader is chosen for a song and the other men provide a chorus. 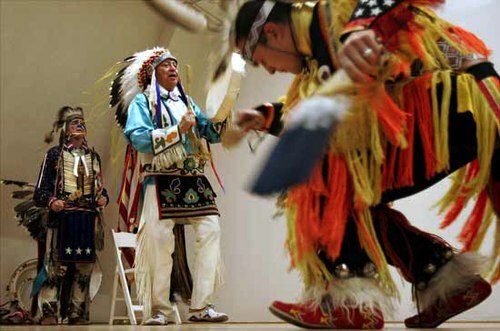 In the native Muskogee language the dance is called Opvnkv Haco, which can mean "drunken," "crazy," or "inspired" dance. This usually refers to the exciting, yet meditative effect the dance and the medicine have on the participants. In the native Shawnee language, the dance is called Nikanikawe which refers to a dance involving friends or nikane. 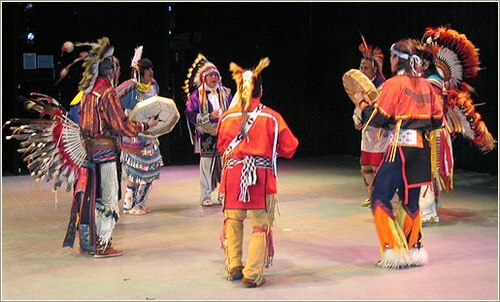 Some societies incorporate Stomp Dance into pow wows or as educational demonstrations. 2) Grass dance or Omaha dance is a style of modern Native American men's pow wow dancing originating in the warrior societies on the Northern Great Plains. Unlike most forms of pow wow dancing, the grass dance regalia generally has no feathers besides the occasional roach feather. Instead, the regalia consists of brightly colored fringe made of either yarn or ribbon. There are several stories behind the origins of the grass dance. One is that a medicine man told a handicapped boy to seek inspiration in the prairie. There he observed the swaying of the grass and received a vision of himself dancing the same style as the grass. When he shared this vision with his village, the use of his legs was returned to him and he performed the first grass dance. Other origins attribute the grass dance to scouts blessing and flattening the grass before moving to a new location, or for a ceremony, dance, or battle. The dancers would also then tie braided grass into their belts. Tying grass to the belt is believed to have led to the yarn and ribbons common today. 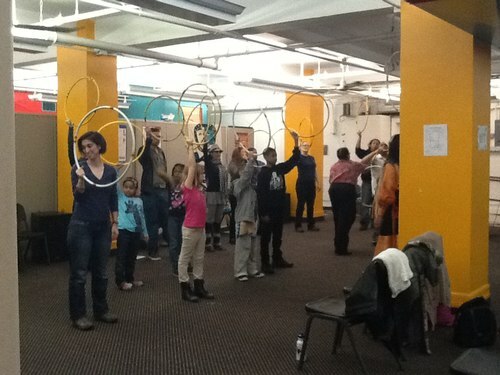 3) Hoop Dance is a form of storytelling dance incorporating anywhere from one to 30 hoops as props, which are used to create both static and dynamic shapes, or formations, representing various animals, symbols, and storytelling elements. It is generally performed by a solo dancer with many hoops. During the dance, shapes are formed in storytelling ritual such as the butterfly, the eagle, the snake, and the coyote, with the hoop symbolizing the never-ending circle of life. Native American Hoop dance focuses on very rapid moves, and the construction of hoop formations around and about the body. Although originally a male-only dance form, in recent years women have become active participants in the hoop dance and in hoop dance competitions. Gathered for this particular evening were Native American descendants, as well as 3-15 year old kids and adults from different races and cultures to create a mixed crowd of about 40 people. When I arrived they handed me a piece of paper with the lyrics from a song. I was confused at first because they were nonsense words. Yes, The stomp dance lyrics vary depending on the age and group that perform it. It's a dance of joy, gathering, celebration and reunion with the community. Louis Mofsie, the director of Thunderbird American Indian Dancers combines intense knowledge, patience and experience to guide the evening and give the background of each dance. The group has had innumerable experiences teaching these dances in different countries, in different contexts, to people ranging from primary school children to professional actors. Thunderbird also collaborates with other professional dance companies such as Force of Nature. The three different dances taught that day were separated by 5-10 minute breaks where people mingled & got to know each other, generating a true sense of community. A supportive atmosphere allowed us all to try the dances and not feel intimidated. As a professional dancer and choreographer what caught my attention was how Louis emphasized the different variations of each dance, because he said that traditionally, each group could use their own creativity to modify the choreography or lyrics of each dance. It's important to remember that these three dances were not ritual or ceremonial! I appreciated how he handled the evening through a polished dance methodology where each line and movement sequence was previously tested and shared through 50 years of experience. After the workshop I was reflecting, writing this article and I asked myself "Why would someone take this workshop, what is the motivation?" I think the answer is simple: to find a community. The Thunderbird American Indian Dancers are the oldest resident Native American dance company in New York. The troupe was founded in Brooklyn in 1963 by a group of ten Native American men and women, all New Yorkers, who were descended from Mohawk, Hopi, Winnebago and San Blas tribes. Prominent among the founders were Louis Mofsie (Hopi/Winnebago) and his sister, Josephine Mofsie (deceased), Rosemary Richmond (Mohawk), Muriel Miguel (Cuna/Rapahannock) and Jack Preston (Seneca, deceased). Some were in school at the time; all were "first generation," meaning that their parents had been born on reservations. They founded the troupe to keep alive the traditions, songs and dances they had learned from their parents, and added to their repertoire from other Native Americans living in New York and some who were passing through. Members of the Thunderbirds range in professions from teachers to hospital patient advocates, tree surgeons and computer engineers who share a commitment to raising scholarships for young American Indian students. Over the years, Thunderbird works, activities and events have assisted more than 400 students. I look forward to continuing this fun research comparing the Native American dances and rituals with various native South American tribes including the Selk'nam in Tierra del Fuego, Argentina (also called Onas, a branch of the Tehuleches). I will keep you informed about Ritual and Dance!